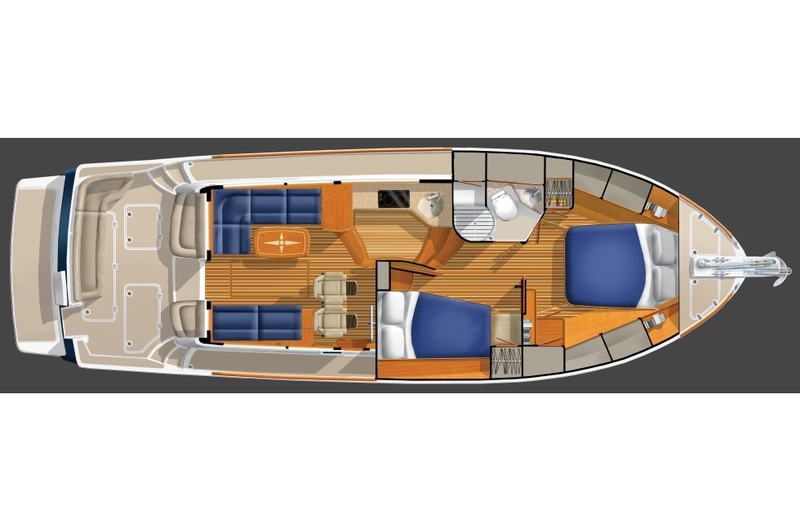 The Sabre 42 Fly Bridge is the outcome of discussions with our clients and prospective clients. 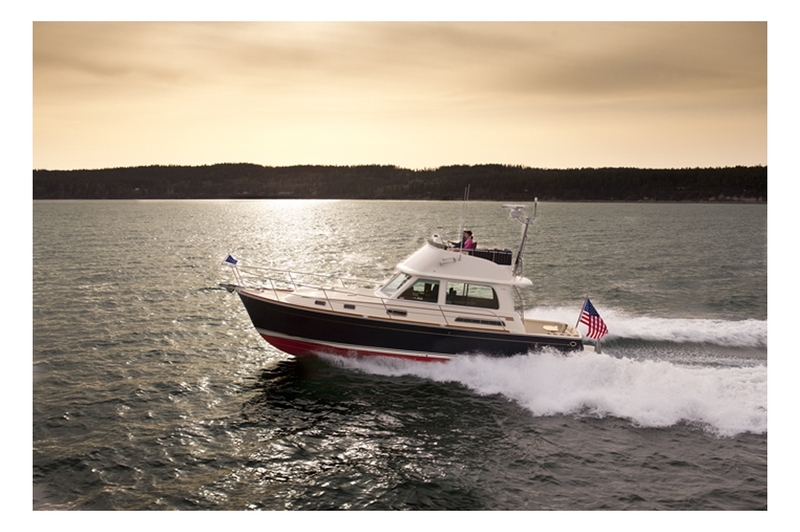 These conversations have led us to create a yacht which offers the same levels of personal luxury and comfort that they have come to expect in their homes and in their automobiles. 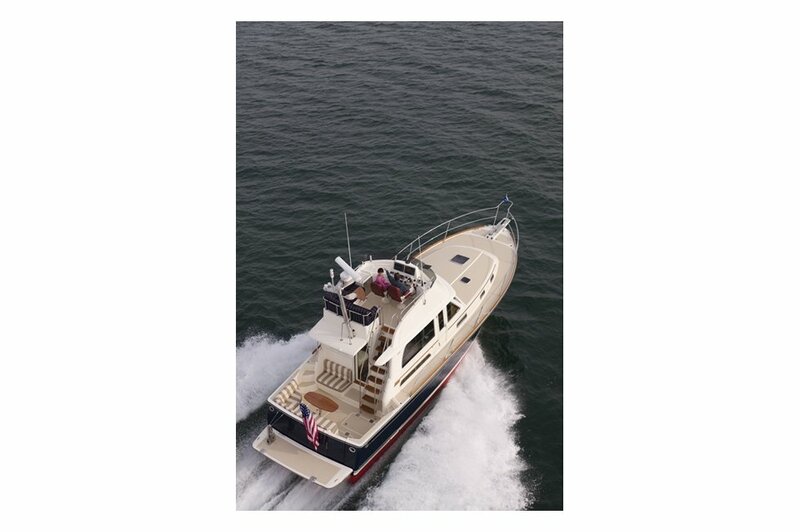 We have developed a yacht with both lower and upper helms, that permits owners to operate from the comfort of the yacht’s interior or from the openness of her fly bridge. Technology is advancing rapidly and our owners have come to expect that when there is a new technology available, Sabre will employ it in all new designs. 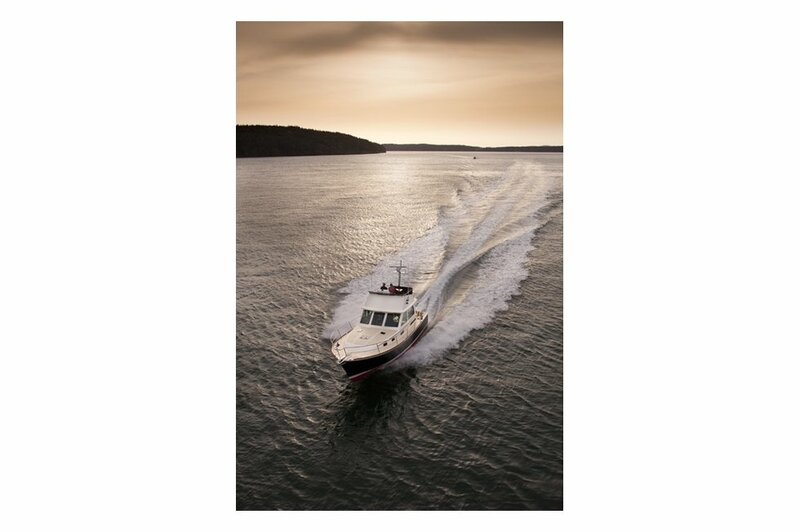 We have dramatically changed the way we build our yachts and the way in which they are propelled. Traditional values such as fine craftsmanship and great looks remain, as our owners have come to expect, but below the elegant surfaces, things are state-of- In our fiberglass shop we have changed to infusion molding. The process is greener in that it uses considerably less resin, and is cleaner in that the emissions levels are much lower. 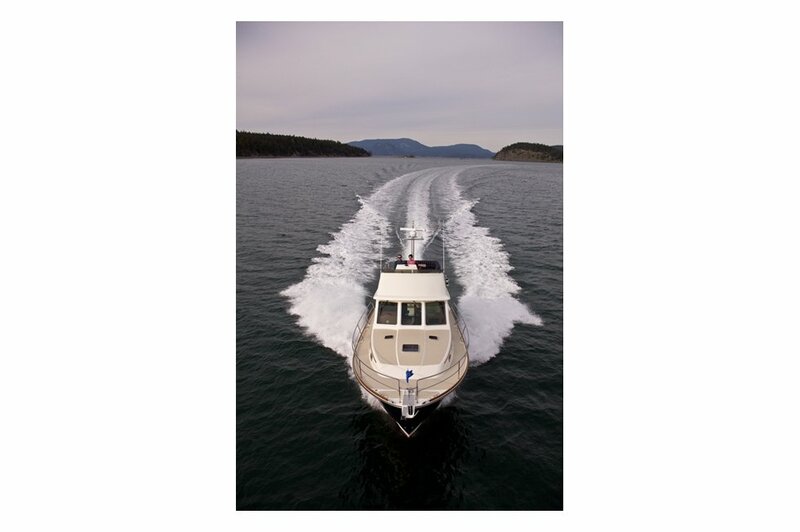 Less resin means less weight, allowing the hull to run faster and use less fuel. Infusion differs from traditional hand lay-up in that all materials are loaded dry into the mold in a stack, which is then covered with a plastic bag to allow the resin to be infused. This creates a stronger part with higher glass to resin ratios. The Sabre 42 Fly Bridge uses Zeus pod drives. 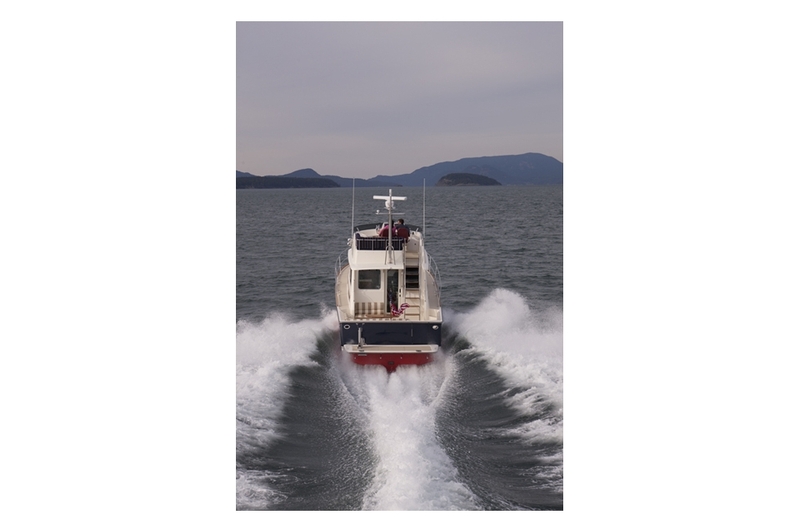 Smaller engines using vectored thrust propel the boat at higher speeds using less fuel. And when maneuvering in tight spaces a joy stick gives increased confidence to the operator. Modified Deep “V” Planing hull design, with shallow pod drive recesses. 16º deadrise at transom, 23º deadrise amidships. Bottom, topsides and transom resin-infused biaxial E-glass with Corecell foam core. LP Painted double boot top. Gold color recessed cove stripe. Resin-infused biaxial E-glass with balsa core. Sliding aft salon door slides starboard to port. Sliding windows in salon cabin sides. One fixed and one opening window in salon aft bulkhead. Large engine room hatch in main salon with compression latches. (6) 12” Stainless steel cleats (2 fwd, 4 mid ship, 2 in aft cockpit). (1) 10” Stainless steel cleat to starboard of windlass as anchor rode tie off. (2) Custom cast stainless steel mid-rail line chocks. 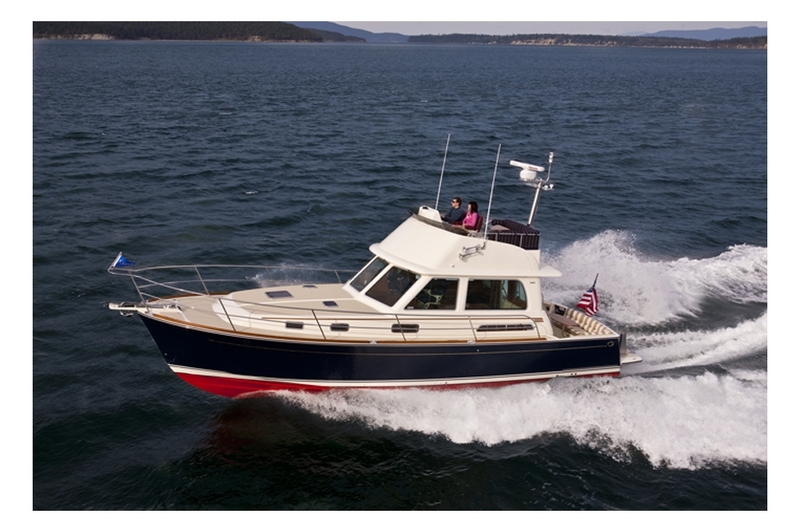 (4) Cast stainless steel hawse pipes in transom and hull sides. Custom stainless steel bow pulpit with dual anchor roller. Anchor windlass, electric rope-chain type. Burgee staff for bow pulpit. 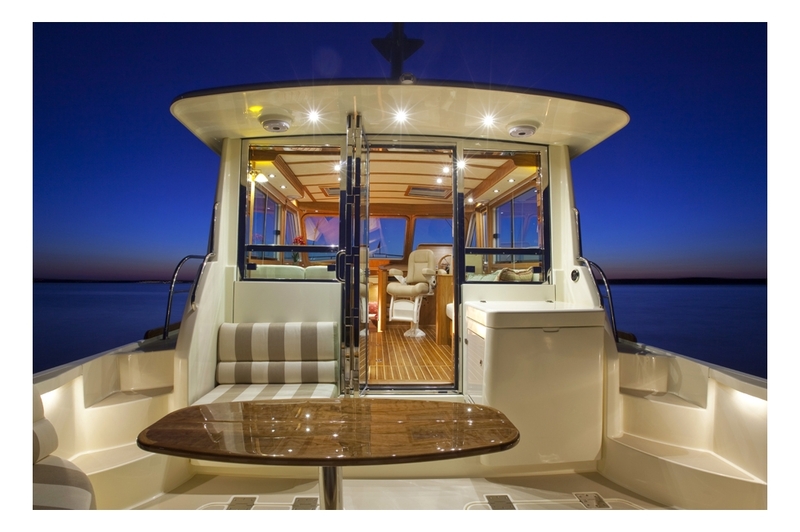 (3) Lewmar Low Profile polished aluminum hatches w/screens. One Cummins Smart Craft display (engine data, tank levels, vessel data, alarms). (1) Stidd N-series helm seat with Ultraleather fabric. Twin Cummins QSB 425hp 6.7 liter electronic, fresh water-cooled diesel engines. 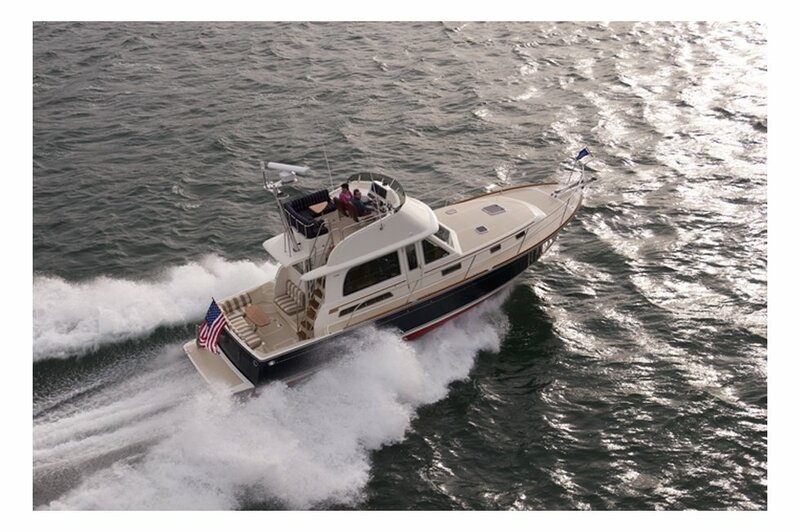 Twin CMD Zeus 3500 pod drives, with integrated steering and trim tabs. (2) 190 gal diesel fuel tanks port and starboard. Racor fuel filters with water in fuel probes. (2) x 2” “Diesel” deck fill plates. “Skyhook” GPS position hold system. Two AGM 4D deep cycle ship’s service batteries. 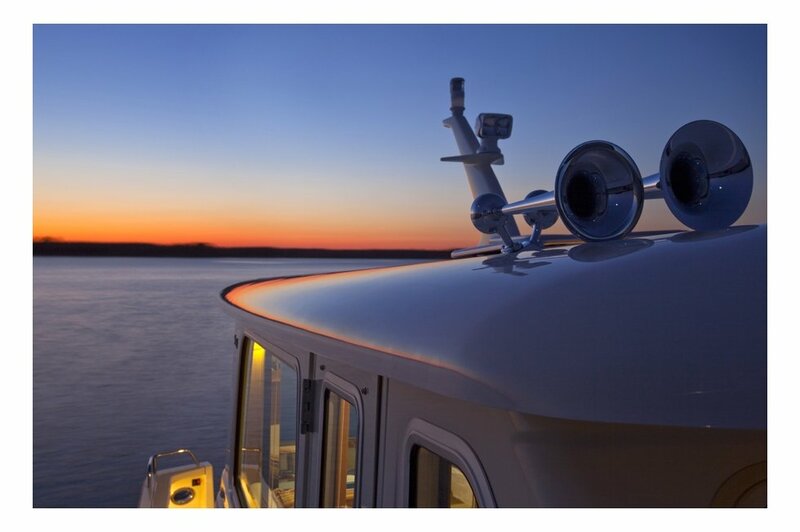 Illuminated main circuit breaker distribution on bulkhead opposite galley. Halogen strip lighting in appropriate locations. 50A shore power cord on Glendining cord reel. Isolation transformer protecting shore power. 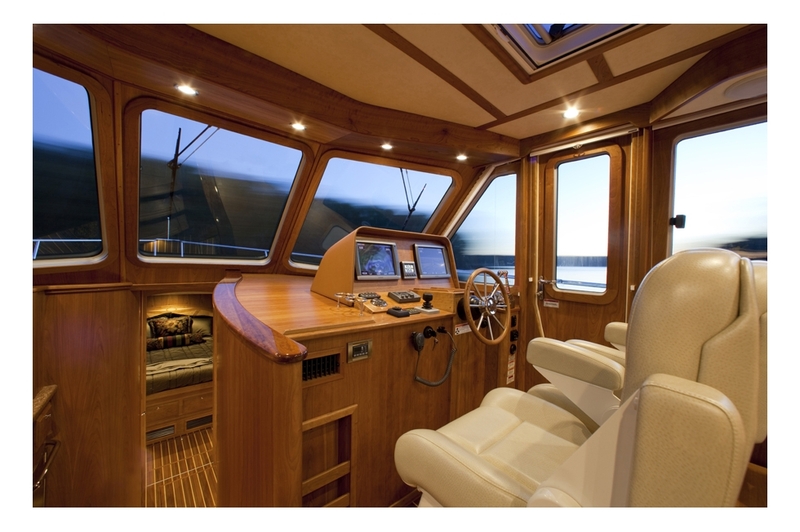 (1) 120V outlet in each cabin and (1) in engine room. 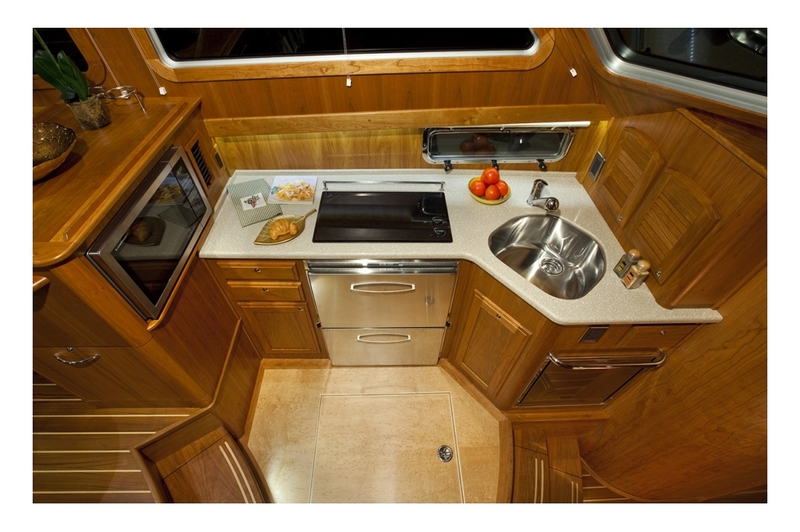 Spacious Island Berth layout with 5″ cushion. ¾” laminated trim. 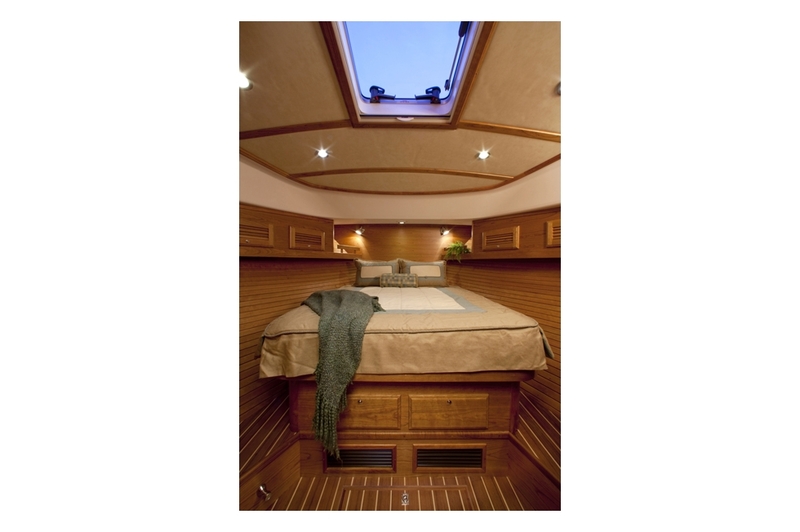 (2) Drawers under berth. A/C return grills under drawers. (2) drawers in bureau w/locker w/shelf above and single louvered door. Upper enclosed shelves with storage behind. Locker face to have (2) louvered doors. 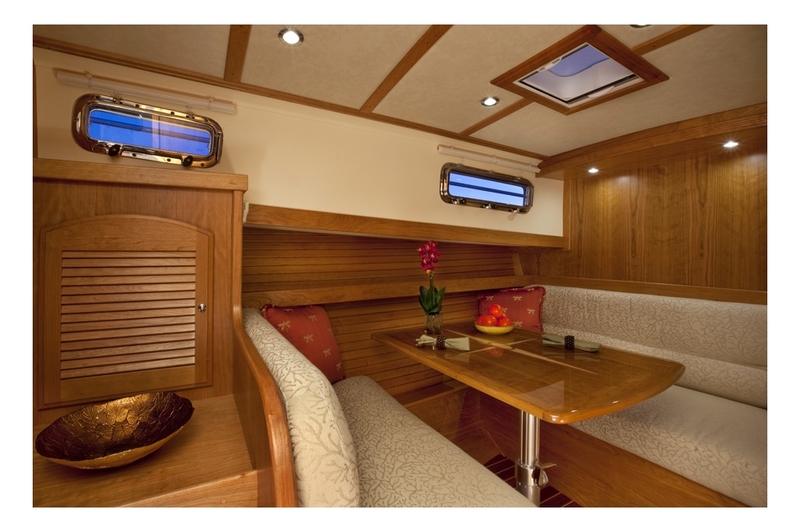 Recessed shelf with fiddle on starboard main bulkhead with 19” LED TV and DVD player. Large cedar lined hanging locker to port, with louvered door, shelf and hangar pole. Open shelf above port hanging locker. Pocket door to forward stateroom. 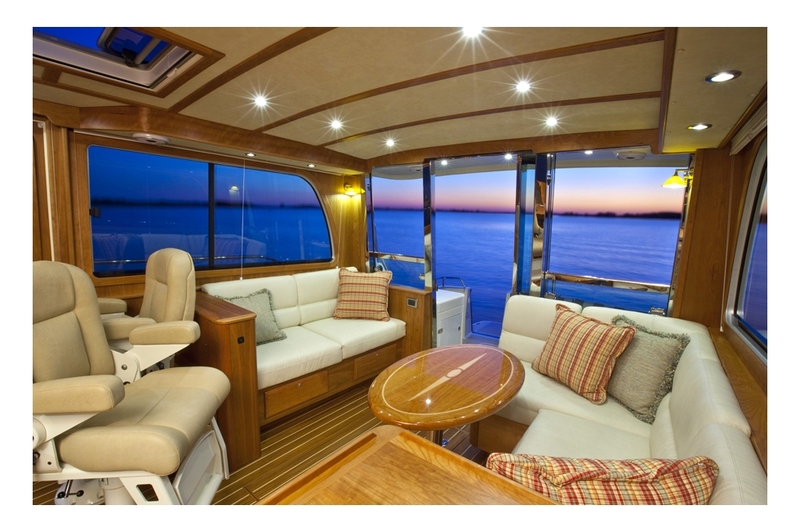 Double berth, 5″ foam cushions, ¾” laminated trim. 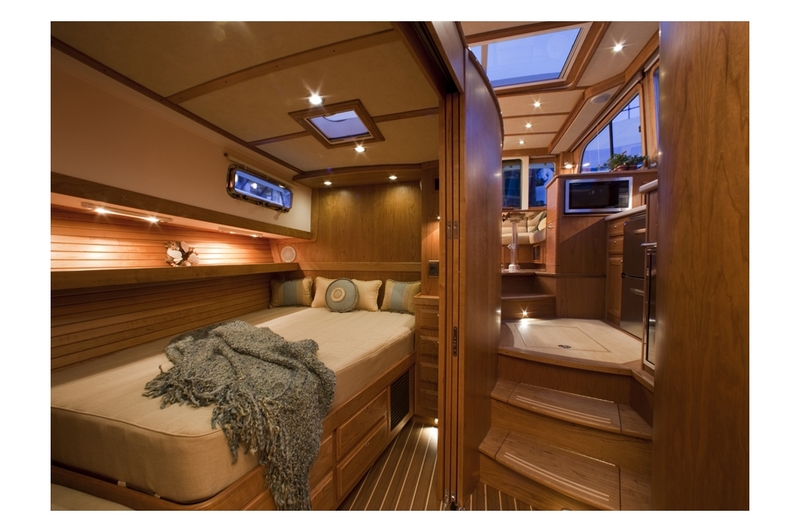 (4) Drawers under berth, A/C return grille beside. Forward bulkhead storage locker, and shelf. Night stand with drawers below. Pocket doors between lower foyer and second stateroom. Optional dinette available in this space. Stainless steel under mount oval sink. Circular shower stall with seat and locker outboard. Wood trimmed mirror over sink. Stainless steel under mount sink with Scandvik faucet. Vitrifrigo 2-drawer Refrigeration with stainless steel doors. Isotherm 1-drawer Freezer with stainless steel door. Convection microwave with stainless steel door above aft counter. Cabinet with (2) louvered doors on forward bulkhead. “L” settee to port, 5” foam cushions, with storage and Sabre tool drawer under. Sunbrella seat coverings. High Gloss finished folding table with hi-low pedestal, lowers to coffee table height. 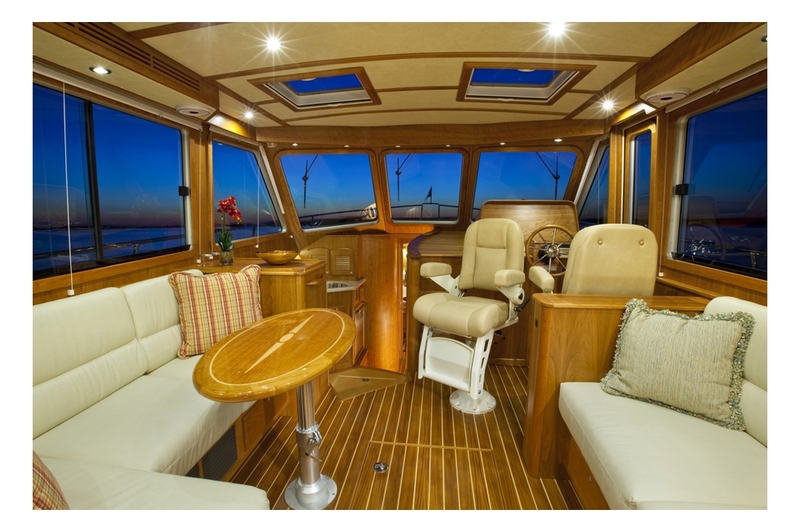 Settee to starboard with end table forward and entertainment unit with 32” LED flat screen TV on lift. Stainless steel, 11 gal. hot water heater, operates on 110-VAC or engine heat. Polyethylene holding tank with 60 gallon capacity. Jabsco Quiet Flush fresh water MSD. Single Cummins Smart Craft display (engine data, tank levels, vessel data, alarms). 16” Stainless steel steering wheel with tilt helm. 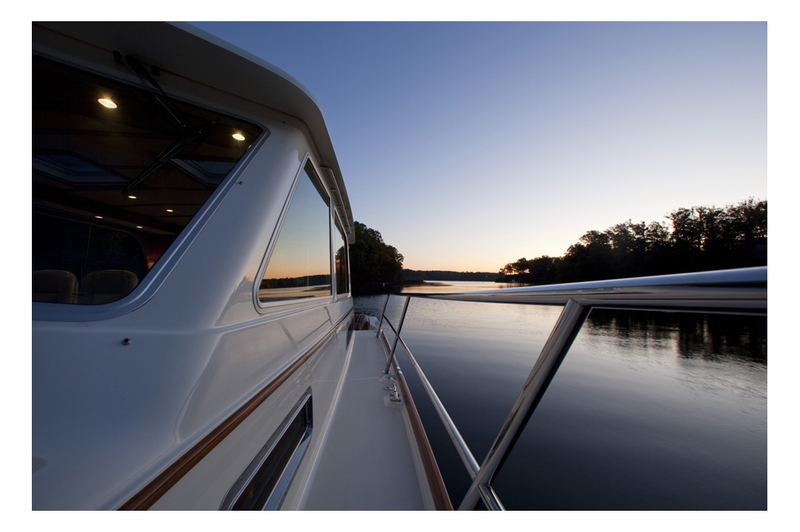 Stainless steel flybridge ladder with teak treads.